McCain Thanks Obama, Defends Palin In 'Washington Post' : It's All Politics McCain rejected those who question Obama's patriotism. He also defended Palin from her critics, though he never mentions her by name. He asks readers to imagine how it would feel like to be accused of a role in the shootings. 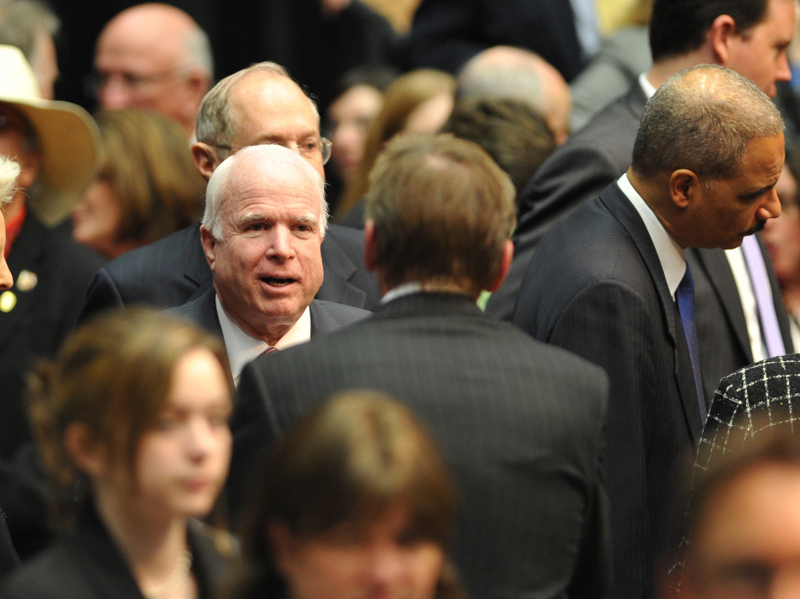 Sen. John McCain arrives to attend the Tucson memorial event, on January 12, 2011. Sen. John McCain may be one of the few people this week to embrace both President Obama and Sarah Palin. He certainly is a unique position, having run against Obama and with Palin in 2008. In a Washington Post op-ed piece, McCain praised the president's Tucson speech for its unifying message. "I commend and thank him for it," he said. In the same piece, McCain, the 2008 Republican presidential nominee, seemed to have his 2008 running mate in mind when he asked readers to consider how hurtful it would be to be accused in some way of contributing to the Tucson attack. Not only did McCain thank Obama for delivering a healing speech, he also rejected charges that Obama is anything less than a patriot. A few paragraphs later, McCain appeared to defend Palin not just from charges that she somehow had culpability in the crime, though he never mentioned her by name. He also appeared to defend her controversial video defense that went viral the morning of the Tucson unity event at which Obama spoke. That doesn't mean, however, that those injuries are always easy to slough off and bear with perfect equanimity. Political leaders are not and cannot reasonably be expected to be indifferent to the cruelest calumnies aimed at their character. Imagine how it must feel to have watched one week ago the incomprehensible massacre of innocents committed by someone who had lost some essential part of his humanity, to have shared in the heartache for its victims and in the admiration for those who acted heroically to save the lives of others - and to have heard in the coverage of that tragedy voices accusing you of complicity in it. Again, his defense of Obama and Palin isn't so much interesting for what he says about the two people as it is for the history he shares with them.